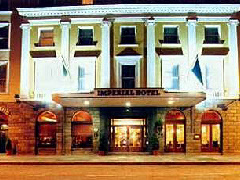 The Imperial has been at the centre of Cork’s commercial life since 1813 when the city’s Merchant Committee requested architect Sir Thomas Deane to build “The Commercial Rooms”. A few years later these were extended to create a hotel and coach-yard. Today, however, the building offers more than just a place for businessmen to meet (its full title is, in fact, The Imperial Hotel with Escape Salon and Spa) boasting around 130 guest rooms in total. Here have stayed literary figures such as Sir Walter Scott, Charles Dickens and William Makepeace Thakeray; the composer Liszt; and it was in what is today room 115 that Michael Collins slept the night before his death.